I love a good sandwich- I mean I really love them. We have an ongoing joke in my family about our search for a good sandwich. We are the family who will drive for hours, stomachs grumbling, moods diminishing, in pursuit of that perfect specimen. There is just something so satisfying when the right combination of bread, condiment, protein, veggie and maybe a little cheese comes together. Of course, my search for the sandwich has petered out the last few years as I've become more and more health conscious. Over the last few years, as I put together my lunches, I've sought out healthier options, salads and nutrient rich soups, basically anything that steers me away from those pesky carbohydrates that rarely benefit my waist line as they turn to sugar. I can't lie though- I've missed my sandwiches. Its such a perfect, handy, filling, delicious lunch. The last couple weeks though, sandwiches have been back in my life in a big way. So why the change? The Flatout Bread Company has entered my life in a delicious way. A couple of weeks ago I was contacted by their PR representatives and asked me to collaborate with the company and Starkist Tuna to develop some recipes and host a little give away for you all- I can't even tell you how fast I jumped at the idea. See, the Flatout Bread Company has created a loophole in the sandwich curse. They have found the way to make a product with almost 50% less carbs than regular bread that is full of flavor, a pillowy texture and makes provides a fantastic base for your favorite sandwich combinations. Now I love tuna- far, far too many of my lunches and dinners feature tuna as my protein of choice. Full of great Omega-3's, and low in fat, it's filling and delicious without adding anything unhealthy to my diet. Starkist has recently launched a great a line of Flavor Fresh Pouches which contain a single serving of tuna, clocking in at just 70 calories, sealed in water, but just enough to keep the tuna from drying out without any need to drain it. I am pretty picky about my tuna, if it gets too fishy tasting at all, my stomach hosts a strike and it doesn't get eaten. I have downed multiple packets of this Starkist Tuna and loved every bite. 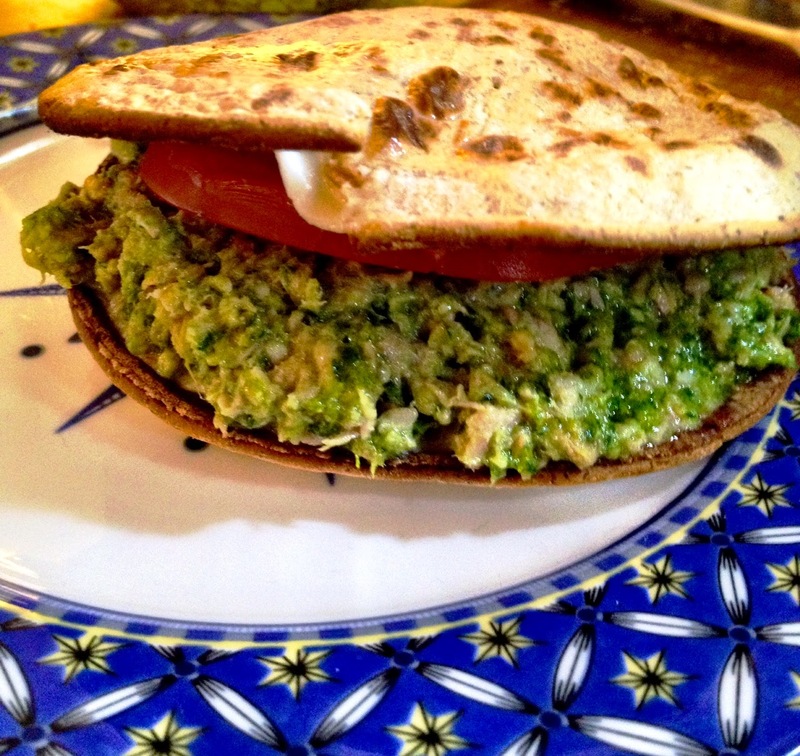 As I started dreaming up recipes I wanted to enjoy the Flatout Breads without losing my normal dose of nutrients from my standard lunch options. I have been loving kale lately- one of those perfect greens that has been linked to decreasing cancer risks, reducing cholesterol, and helping the body to naturally detox. I eat it daily and so I wanted to combine it here in a new way, and so with some creative thoughts, the Healthy Italian Tuna Melt was born. In a food processor, or blender, combine the first 5 ingredients and begin processing. Gradually add the olive oil until a loose paste is formed. Spoon the mixture into a small bowl and combine with the two packets of tuna. Place two flatbreads on an ovenproof dish and top with two slices of mozzarella cheese on each. Broil the breads until the cheese melts and remove from the oven. Transfer the breads to a serving plate. Top with the tuna mixture and a slice of tomato on each, fold and enjoy!